We are very grateful to the owners of Mount House to allow us to copy and reproduce an abstract of title from 1689 - 1802. 10th September 1689 Mich. Term 1 Geo 2d. To hold unto and use of said Jeremy Gunne and his heirs a covenant for further assurances by him or otherwise. 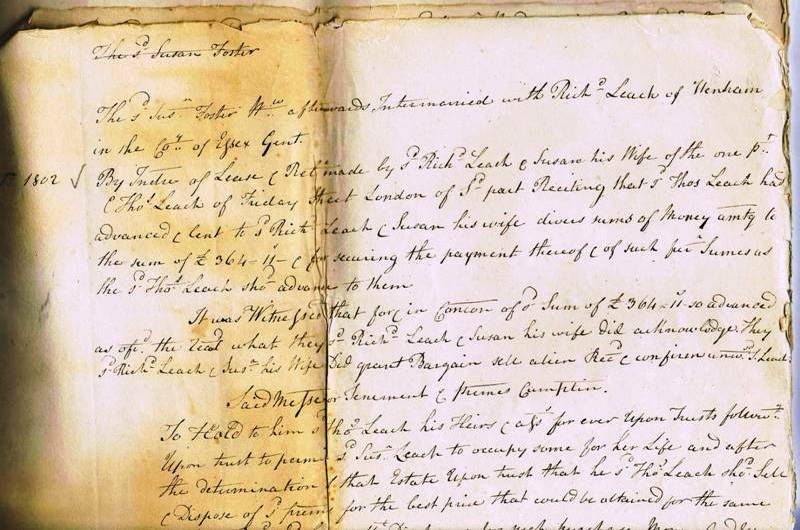 By feoffment with livery of seisin indorsed Jeremiah Gunne for £33 grants enfeoffs and conveys rent..Samuel Gunne and his heirs. that there was due from said Gunne to said Newland for principal and consideration £39 3s. It is witnessed that said John Newland in consideration of £39 3s. and of £5.. apiece paid by Pryor and Henry Bacon did with consent of said Gunne assign unto said James Pryor and Henry Bacon in trust for said Pryor and Elizabeth his wife. To hold unto said James Pryor and Henry Bacon and their executors for rent of said 500 years term upon trust for said Pryor and his wife and their heirs that said term and estate thereby assigned should attend in inheritance of said P... which were intended to be conveyed to said Thomas Pryor and wife and their heirs. By lease and release Samuel Gunne for £55 did grant and convey unto said Thomas Pryor and Elizabeth his wife and their heirs. By Indre tripartite betrween John Greygoose son and heir of Susan Greygoose deceased of the first part, William Matthews and Elizabeth his wife formerly Elizabeth Pryor of the second part and Samuel Wood the third. 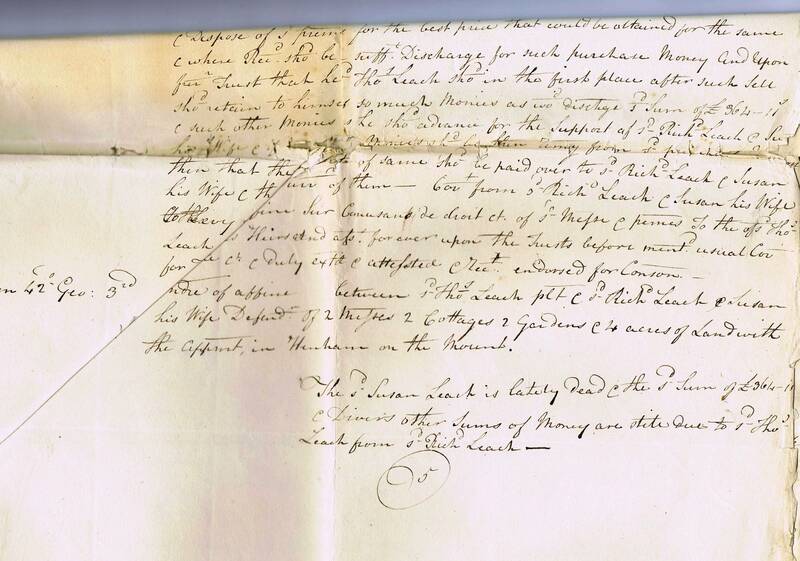 Reciting said indre of mortgage of the 28th June 1725 and that £5 15s was not paid to said George Newland at times in said indre appointed whereby term and estate thereby granted did become absolute in law in said George Newland. 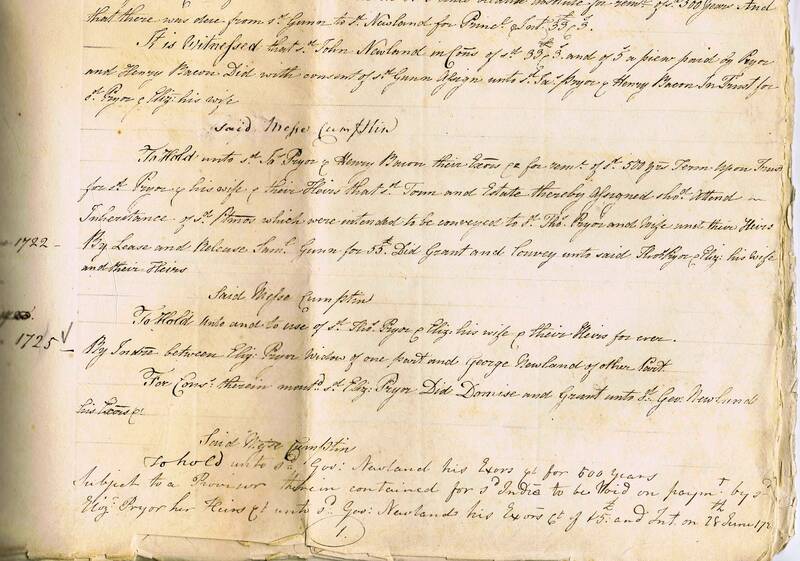 And reciting said indre of 19 Feb 1728 and that of said £34 was not paid to Susanna Greygoose at time mentioned in said indre...by reason whereof estate and term in said... became absolute in said Susan Greygoose and her executors and that there was due to said John Greygoose for principal and interest £34 10s. 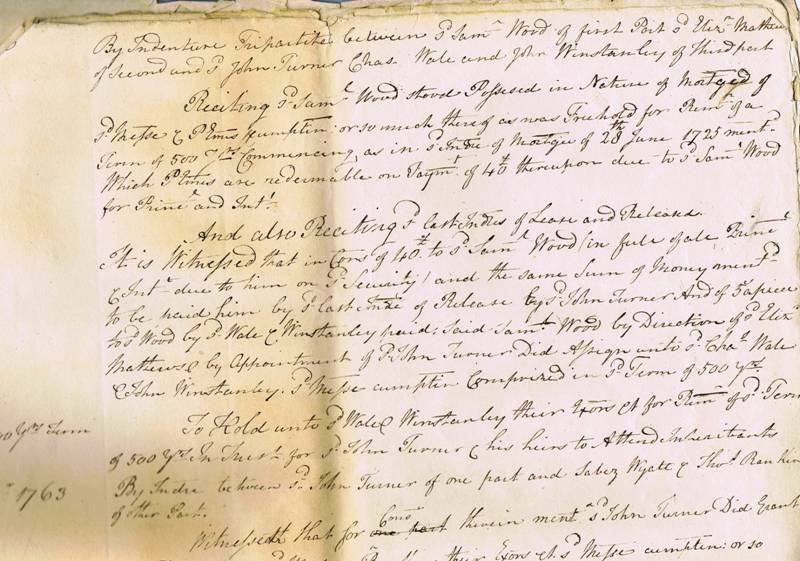 To Hold unto Samuel Wood his executors ..for term of 500 years discharged of all powers and equity of ....subject to proviso that if said Matthews or his heirs should pay to Samuel Wood or his executors of £35 17s. 6d. on 10th July 1734 then the said Wood or his executors would surrender or assign all his estate and interest in ....Discharged of all incumbrances done by him unto said William Matthews and his heirs or as he or they should direct. By lease and release both tripartite ... made between Samuel Wood, Playle nephew of heir of Thomas Playle deceased of first part. Elizabeth Matthews (widow and relict of William Matthews deceased) of the second part and John Turner junior of the third. Reciting said indre tripartite of 19 Feb 1728 and as or to export (?) £..therein recited and said John Turner had agreed for purchase of said premises (int. alia). 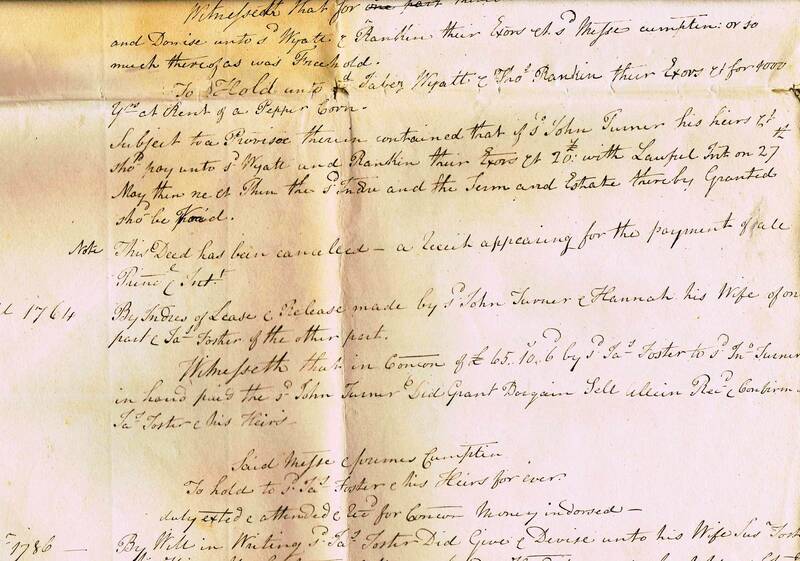 It is witnessed that in consideration of £40... thereof to said Samuel Wood to whom ..were mortgaged and in discharged thereof...£4 resided of said purchase money to said Elizabeth Matthews paid by said Turner and of £5 to said Samuel Playle the said Samuel Playle by direction of said Elizabeth Matthews did bargain sale and release unto said John Turner and his heirs said messuage Cumplins or so much thereof as was freehold. 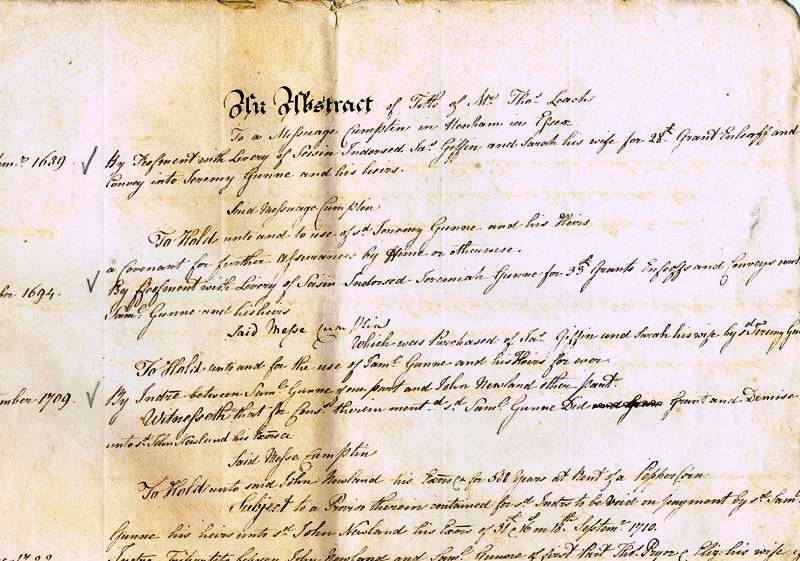 To hold unto and to use of John Turner and his heirs. Indre of a fine levied between James Bacon (Plaintiff ?) 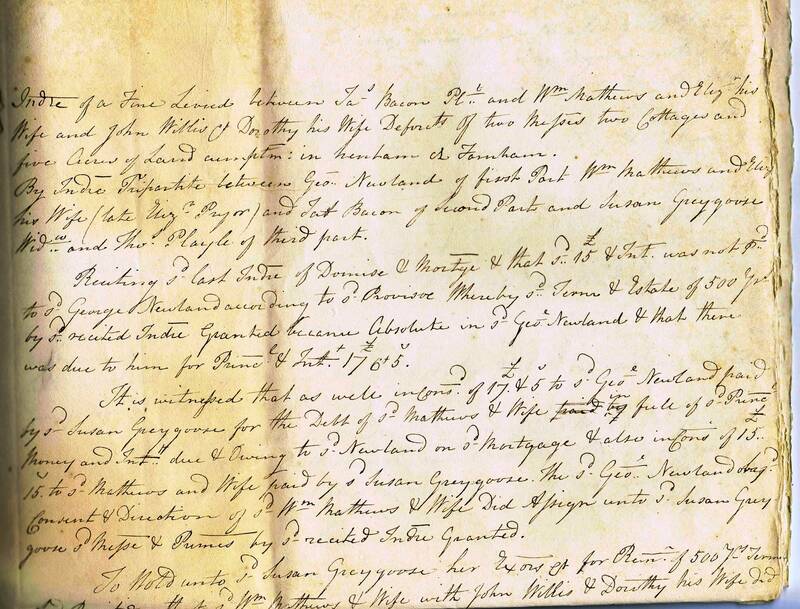 and William Matthews and Elizabeth his wife and John Willis & Dorothy his wife Defendant of two messuages, two cottages and five acres of land (in occupation"?) in Henham and Farnham. By Indre Tripartite between George Newlands of the first part, William Matthews and Elizabeth his wife, late Elizabeth Pryor, and James Bacon of the second part and Susan Greygoose, widow and Thomas Playle of the third part. Reciting said last indre of devise and mortgage and that said £15 and interest was not paid to said George Newland according to said proviso whereby said terms and estate of 500 years by .. recited indre. Granted, became absolute in said George Newland was due to him for principal and interest £176 5s. 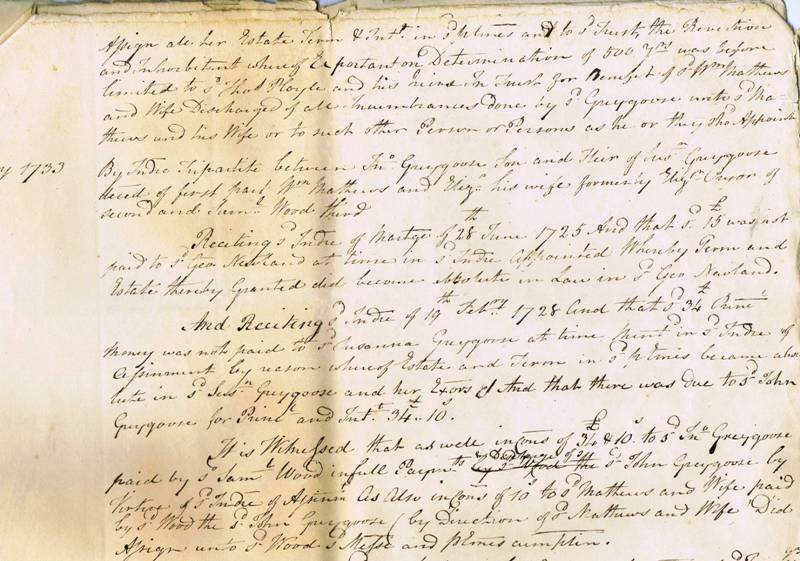 It is witnessed that as well in consideration of £17 5s to said George Newland paid by said Susan Greygoose for the debt of said Matthews and wife in full of a principal money and interest due and owing to said Newland on said mortgage and also in consideration of 15 to said Matthews and wife paid by said Susan Greygoose. The said George Newland ... consent and direction of said William Matthews and wife did assign unto said Susan Greygoose said messuage and premisies by said recited indre granted. To use of said Thomas Playle and his heirs. 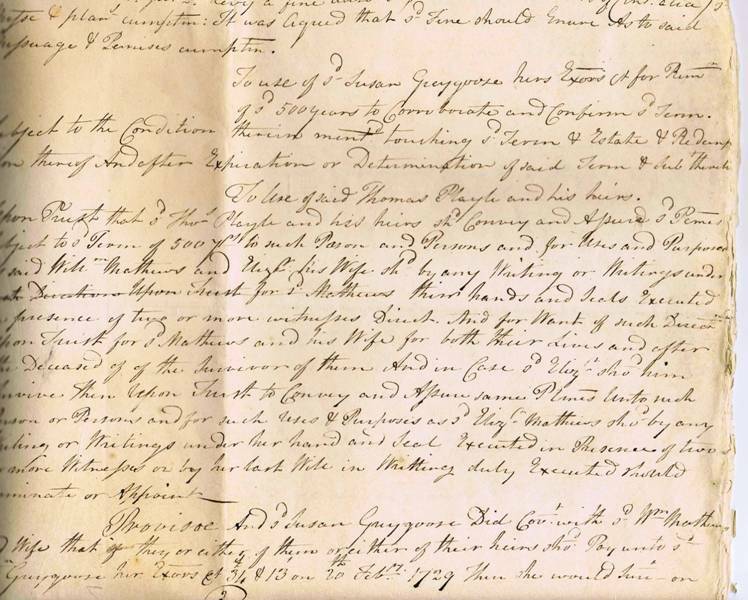 Upon Trust that said Thomas Playle and his heirs should convey and assure said premises subject to a term of 500 years to such person and persons and for uses and purposes.. said William Matthews and Elizabeth his wife.. by any writing or writings under their hands and seals executed in the presence of two or more witnesses direct. And for want of such direction upon trust for said Matthews and his wife for both their lives and after ..deceased of the survivor of them and in case said Elizabeth should him survive then upon trust to convey and assign same premises unto such person or persons and for such uses and purposes as said Elizabeth Matthews should by any writing or writings under her hand and seal executed in the presence of two or more witnesses or by her last will in writing duly executed .....or appoint. Proviso... and said Susan Greygoose did consent with said William Matthews and wife that if they or either of them or either of their heirs should pay unto said Susan Greygoose, her executors £34 13s on 20th Feb 1729 then she would...on..
By indenture tripartite between Samuel Wood of first part, said Elizabeth Matthews of second, and said John Turner, Charles Wale and John Winstanley of the third. 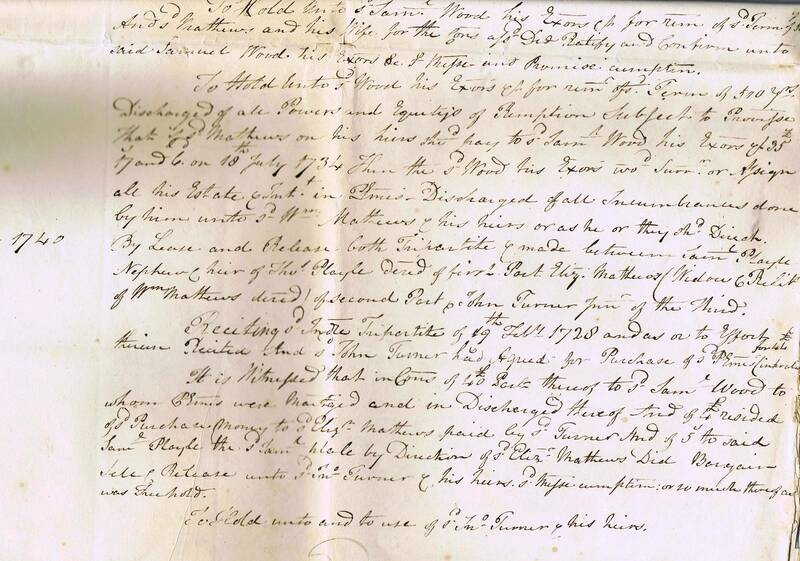 Reciting said Samuel Wood stood possessed in nature of mortgage of messuage and premises Cumplin or so much as there was freehold for ... of a term of 500 years commencing, as in seisin of mortgage of 28th June 1725 mentioned which premises are redeemable on payment of £40 thereupon due to Samuel Wood for principal and interest. And also reciting last indre of lease and release. It is witnessed that in consideration of £40 to said Samuel Wood (in full sale principal and interest due to him on said security and the same sum of money mentioned to be paid him by said last indre of release by said John Turner and of £5 apiece to said Wood by said Wale and Winstanley paid said Samuel Wood by direction of said Elizabeth Matthews by appointment of said John Turner did assign unto said Charles Wale and John Winstanley said messuage Cumplins. Confirmed in said term of 500 years. To hold unto said Wale and Winstanley their executors.. forterm of 500 years in trust for said John Turner and his heirs to attend inhabitants. Witnesseth that for ......and devise unto said Wyate and Rankin or their executors the said mesdsuage Cumplin or so much thereof was freehold. 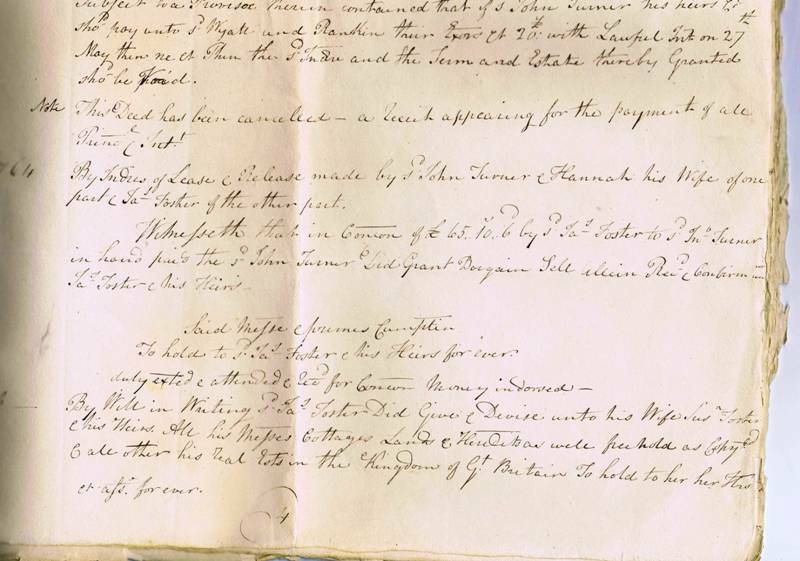 To hold unto said Jabez Wyatt and Thomas Rankin or their executors for 4,000 years at rent of a pepper corn. Subject to a proviso: therein contained that if said John Turner or his heirs should pay unto said Wyate and Rankin or their executors £20 with lawful interest on 27th May ..the.. and the term and estate thereby granted should be void. 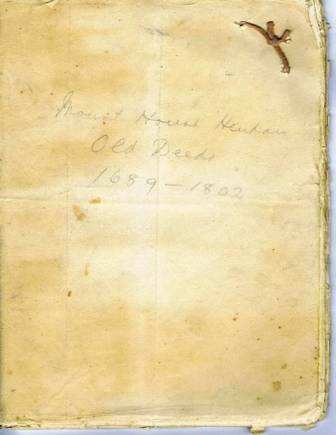 Note: this deed has been cancelled – a receipt appearing for the payment of all principal and interest. 1802 - the said Susan Foster afterwards intermarried with Richard Leach of Henham in the county of Essex, gentleman. By indre of lease and release made by Richard Leach & Susan his wife of the one part and Thomas Leach of Friday Street, London of said part reciting that said Thomas Leach had advanced and lent to Richard Leach & Susan his wife diverse sums of money amounting to the sum of £364 11s for securing the payment thereof and of such ..sums as the said Thomas Leach should advance to them. 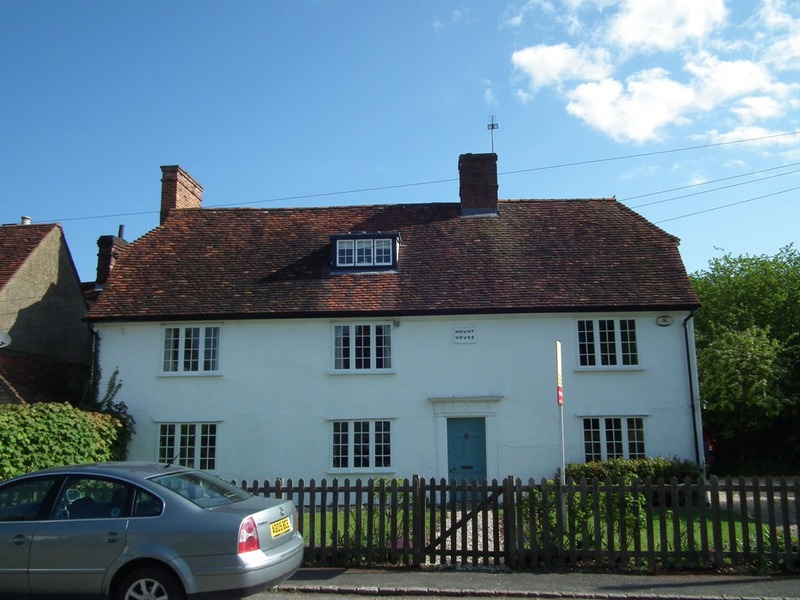 Note of assign between said Thomas Leach plaintiff and said Richards Leach & Susan his wife defendants of two messuages, two cottages, two gardens and four acres of land with the appurtenances, in Henham on the Mount. The said Susan Leach is lately dead and the sum of £364 11s and diverse other sums of money are still due to said Thomas Leach from said Richard Leach.